Vintage From Paul is delighted to offer these classic Scammell China Colonial Restaurant Ware Dinner Plates. These Scammell China Colonial Restaurant Ware Dinner Plates are nearly identical to those from the Syracuse China Company in the Colonial pattern. The difference that we see is that the colors, particularly the bluyes are a tone deeper, and the mustard banding at the rim a tad wider. Notes: A multi-colored, multi-floral stock pattern with a dark yellow (deep mustard color) line border. The Scammell China Colonial Restaurant Ware Dinner Plates measure 9-5/8 inches in diameter at the top. 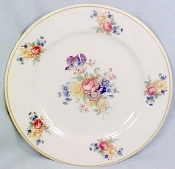 The Scammell China Colonial Restaurant Ware Dinner Plates are impressed with "Scammells trenton NJ USA"
Each of the available Scammell China Colonial Restaurant Ware Dinner Plates in superb condition no chips, cracks,or scratches. The banding is without defect, the colors vibrant, the graphics crisp. These plates appear to be unused.